CanadianMotorcycleRider has been around since late 2007 and I've read my fair share of motorcycle themed books since then and with a few exceptions I enjoy them all to a degree. Some are technical, some are light, some have tones of arrogance, some talk about riding, some talk about a life event and have motorcycle themes weaved in, and some are written more skillfully than others. 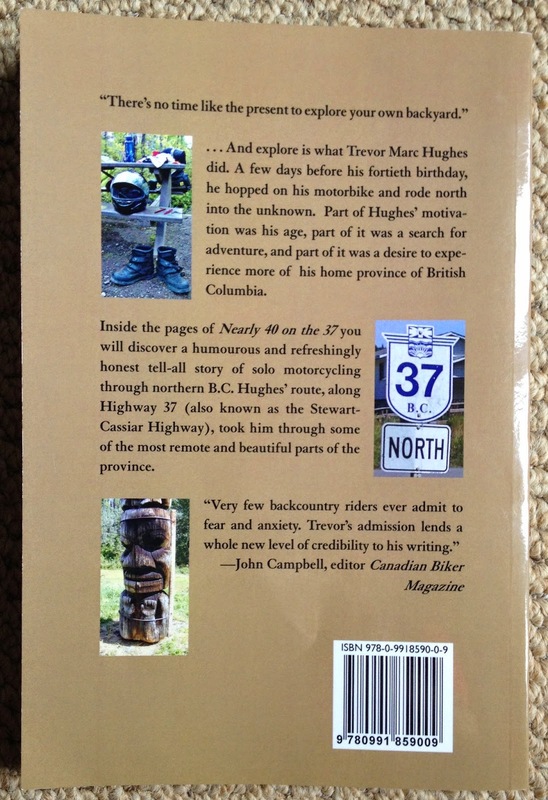 Trevor's book, Nearly 40 on the 37, is a well written and interesting read from a regular guy nearing his fortieth birthday. It just so happens that he likes motorcycles and plans to go exploring beautiful BC on perhaps the best mode of transportation to experience an adventure on - a motorcycle! We're along for the ride as he travels solo along British Columbia's remote Highway 37. Nearly 40 on the 37 will fit perfectly in the pannier of your motorcycle if you plan to head on a little motorcycling adventure of your own and don't want a tome of novel to drag you down for the ride. I managed to read it cover to cover in just a few days. I'm not a fast reader by any means but the subject is interesting and light. It's a book that you'll want to pick up and finish. About Trevor Marc Hughes: Prior to writing, Trevor was an actor, most notably when he was barely out of his teens on the television series "Northwood" for CBC Television. He was a freelancer, part reporter, part independent producer and sometimes arts reporter at CBC Radio Vancouver for over nine years. During this time he also contributed to National Public Radio and publications such as Pacific Mariner and Celtic Connection. He lived in London, England briefly where he helped out at BBC Radio Five Live at Broadcast Centre. The Signet Q is a full-face sport helmet that takes technologies and construction methods gleaned from the race track. These attributes are incorporated into a high-performance street helmet. 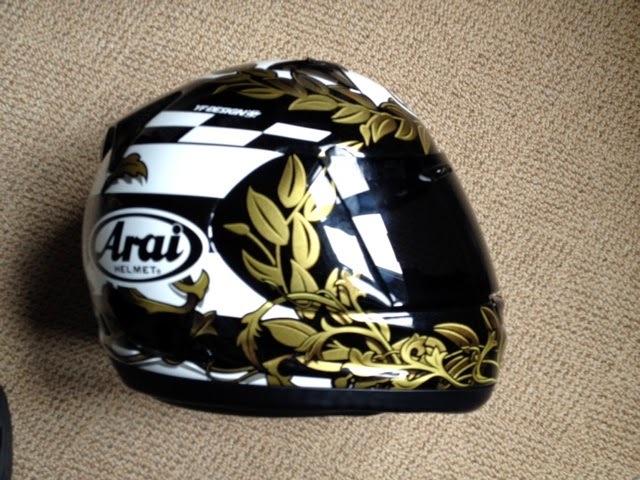 Our short take on the Signet Q is that it's a fantastic helmet and the Laurel graphic is amazing. I haven't really been a fan of graphic helmets but this one has changed my mind. It's a GREAT looking helmet - especially with the black visor. The black visor blends in with the black graphics on the helmet for a really integrated look. You'd be hard pressed to find much to dislike about this helmet. Construction is top notch, visibility is great, ventilation is excellent. It's a great helmet. The only thing is - it's not cheap. Canadian online retailers are selling them for around $770 CDN. Sometimes you do get what you pay for and I don't think you'd be disappointed in this purchase. It is an expensive helmet so be sure to have it properly fitted. The only slight niggles if I were forced to come up with any would be that there is an abundance of vents on the helmet and it can be a bit complicated to adjust them all while on the move. There's a total of five vents on the front of the helmet - which are all operated separately and a single exhaust vent (opens/closes two vents) at the rear. The front chin vent is near the bottom edge of the face shield and you usually end up touching the face shield when making adjustments, which could lead to scratches or smudges from your gloves. It is really low on the helmet so even if you do end up with scratches or smudges I don't think it would affect visibility all that much. The numerous vents could be considered a major benefit too because you have a lot of options to customize air flow. The in-visor vents (also referred to as brow vents) are pretty nice and they direct air towards, you guessed it, your brow. Arai believes it's the best way to provide that sort of venting because they want to minimize openings so near what is already the biggest opening in the helmet shell - the facial opening. I felt like it works quite well. 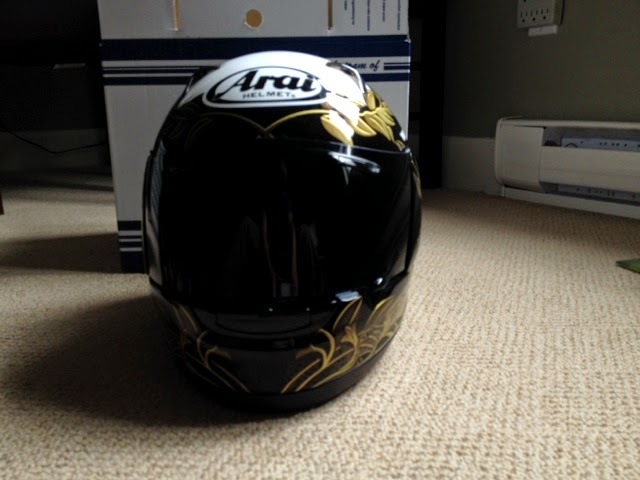 Arai has been making helmets for a long time and according to them: "Arai is not some massive corporation run by rotating boards of directors with rotating missions, all of which have one thing in common: more profits and cheaper productions costs. Arai is a small family company, driven by the same family, with the same mission, through three generations-three generations that have all been riders. This fact tends to make you look at things differently than the big guys do. Aria don't build Arai helmets to meet any safety standards; we build them to EXCEED the standards. At Arai, safety standards like Snell or DOT are the baseline, not the goal. Why? Because standards create minimum criteria. And while many helmet makers design their helmets to meet those minimums, "good enough" has just never been good enough around here. Not for us, not for the riders we serve. (Remember, we answer only to ourselves.) The absence of exaggerated edges or protrusions in the shell is not a lack of creativity, but a commitment to maintaining the integrity of the shell with impact performance in mind. Our standards are made for the real world. The world of distracted drivers, unpredictable situations, sharp angles. Things that don't move when you hit them. A world you can't duplicate in a controlled, predictable testing laboratory environment looking for a common denominator. For example a major feature of the Signet Q is the shape and exterior pieces - It's a very smooth design without a lot of big pieces on the exterior to catch on anything should the rider be involved in an accident. You definitely don't want your helmet catching on anything if you're sliding along the pavement! While outwardly nearly identical to the RX-Q, on which it is based, the Signet-Q interior is a world apart. In simple terms the Signet-Q is an elongated version of the RX-Q, adding 5mm front to back, providing the room necessary for a truly Long-Oval (L/O) interior. This L/O shape can trace its roots directly to the legendary Signet series, the namesake of this new model. The “Q” designation signifies the innovations and benefits proven so successful on the RX-Q. The elongated shell and interior liner, front to back, give the new Signet-Q the ability to end forehead pressure and hot spots for riders whose heads are significantly longer front to back and narrower side to side. For head shapes that are longer, but still have a bit of width, the Signet-Q interior head liner has 5mm peel-away pads on both sides to allow the rider to micro-fit themselves without the need to change size or purchase optional comfort liners. The Signet-Q is the result of Arai’s long history of understanding the complexity of the relationship between head size and head shape. 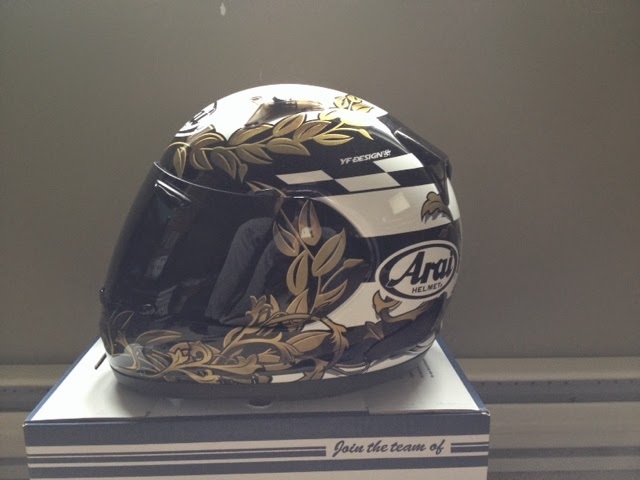 Arai America's website - Signet Q section. 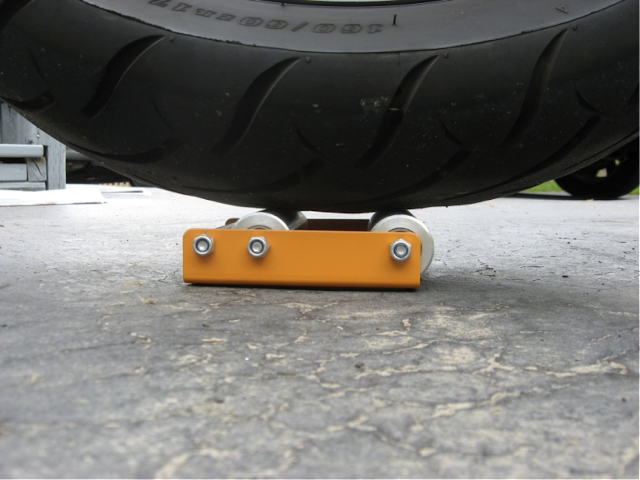 The WheelJockey is a product created by Bill Kniegge of BlueStrada Tours. Blue Strada Tours is a motorcycle touring company based out of North Carolina and they use a fleet of Suzuki VStrom's. One thing about the VStrom though; they don't come standard with a center stand. So - Bill had a bunch of bikes that needed regular chain maintenance and thus the WheelJockey was born! We've had this product on the shelf waiting to be reviewed for a while but it was handed off to the owner of a Suzuki SV650 which seemed rather fitting! This review was written after the authors first use of the WheelJockey. The instructions do indicate that it'll take a little practice to get good at figuring out the proper amount of force to use to get your bike up onto the WheelJockey. It ships in a tiny little box and appears to be very sturdy and well made. It's so small that you can probably keep it under your seat so that you'll have it wherever you might need it. While following the included instructions, the WheelJockey was used to assist in cleaning the bike chain. The WheelJockey was placed in front of the rear tire as instructed. The bike was stood straight up and rolled forward. It took several attempts at pushing the bike onto the WheelJockey to determine how much force was required to get the rear tire exactly where it needed to be on the device given that the WheelJockey is almost 1.5” high. Once the bike was up on the WheelJockey, the main function of the device was put into use. The instructions say to rotate the wheel using the spokes and not to push or pull on the tire itself. However, this rule is somewhat difficult to adhere to when the spokes are not in the best position to grab and rotate. It made sense that the reason behind not pushing or pulling the wheel was because the bike may come off the WheelJockey. It was discovered that if you are careful, and use two hands positioned opposite each other on the wheel (ie: like you are at “9” and “3” on a steering wheel), you can effectively and safely rotate the wheel without putting excessive lateral forces on the whole bike enough to make it come off the WheelJockey. The chain was cleaned and waxed while on the WheelJockey which proved to be a good tool to get this kind of maintenance work done. Once completed, the bike was stood up and walked forward off the WheelJockey. An additional note regarding the use of the WheelJockey is that whether you use the wheel spokes to rotate the wheel, or the method described above, the bike itself can eventually roll off the side of the WheelJockey. The cause for this is due to the bike itself being on a side stand. The angle at which the bike tire is positioned on the WheelJockey leaves it almost as an inevitable problem once the tire has been rotated enough times to “spin-off” the side of the WheelJockey. Although paying careful attention can prevent this problem, if care is not taken, the bike can come off of the WheelJockey and potentially tip over. Overall, the WheelJockey was found to be a very good assistant for bike maintenance with a side-standing bike when an actual rear bike stand is unavailable. Thanks go out to Bill at WheelJockey for providing a sample. We got a tip from the Wheel Jockey creator -To keep the wheel/tire centered on the rollers and from creeping to the right side, a small amount of pressure to the left while turning the wheel will keep it centered. The key being... 'while turning the wheel...'. Republished with permission by author Rob P.
* (Leatt brace attached in pics). Riding a bike offroad in Newfoundland has it's rewards in scenery and unlimited riding areas...it's beautiful and dangerous. Newfoundland is affectionately known to many as "The Rock" and for good reason. We have lot's of rocks (the oldest in the world in fact ) We have little rocks and bigs rocks, dry rocks and wet slippery rocks...they all hurt when going down. I hate riding on rocks, and I'm very much afraid of them. After having suffered some very serious injuries in the recent past, safety is of the upmost importance to me and my family. I need protective riding gear, and I need good stuff. I researched every piece of riding armour I could find. Everything from the Batman suit to plain roost guards to compression suits to hockey equipment and everything in between. My search for riding gear ended at the Tekvest ( Offroad Max model with optional arm pads ). There is no other product that I have found that offers the level of protection and comfort that the Tekvests offer. I have tried on various compression suits and instantly disliked the tight constricting type of feel. I hear that you forget about comfort or lack of with the compression suits when riding but I hated them when simply trying them on. That said it was not comfort that drew me to the Tekvest, it was the protection. The type of plastic used (UMHW) is unbelievable stuff, a 1 inch slab of it will stop a .45 bullet @ 25 feet (the vest is not 1 inch thick so do not test this!). To me that means it's rock proof. The Tekvest also floats! The vest does not offer enough floatation to be classified as a certified floatation device, but it will keep you afloat for those deep crossings. 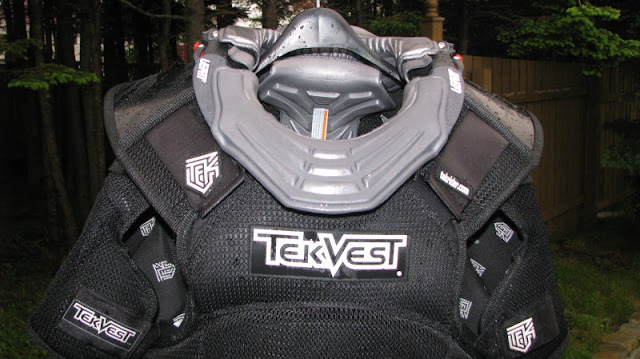 The Tekvest completely wraps your torso and the level of protection is clearly evident. As for sizing, it's very adjustable and can be worn inside the Jacket or over. Lately with the warmer weather I wear a dri-fit type t-shirt under the vest, and it's super cool and comfortable. For the cold days I have worn a couple different jackets under the vest and it's awesome and warm. Under the jacket wearing is a bit too warm for this time of year (late July). The Offroad Max has A LOT of vents so air passes though when it's exposed. The thing is built tough as nails so, wearing it on the outside exposed to the elements is not a concern (hose it off baby). I had mine made in black for easier cleaning. As for fit, mine is a large (I'm 6' and weigh 210-215 on average). Certain models of Tekvest fit differently and one should talk to Tekrider and give body type to ensure best fit. The Offroad Max is a big fit. Some of the winter versions are smaller fits. The proper fit is for the vest to float on one's body - not too tight. Mine literaly floats and the comfort level cannot be described. There seems to be very little contact points on the body, but at the same time you're completely covered. The Vest accommodates a Leatt brace absolutely perfectly with no need of straps on the brace (I've been told that the Offroad Max will accommodate all the current models of neck braces). Not all Tekvest models are neck brace compatible though. All in all I am delighted in my Offroad Max Tekvest and feel a lot more secure when riding with it. In fact I will never ride without it. Karen @ Tekrider.com was awesome to deal with and answered all my questions. She accommodated my request for color and gave me a great price (sent me an invoice via e-mail, and a day or so later Purolator delivered my Vest right to my door). She also extended any RTR member 20% off the products. They have made deals like this with other riding groups before. If Tekvest ever extends their product line to other pieces of riding gear. I'll be the first in line to get them! Question: Do you figure this type of suit is no worse than the old-school vented flack-jacket style MX gear, when it comes to being too warm? Not sure how the two would compare with regards to warmth. But one of the reasons I chose the Offroad Max model was for the extreme amount of venting. You can make out the vent holes in the pics. They're through the mesh (there are a lot of them, even in the arm panels). They allow a lot of airflow let me tell you (you can actually feel the wind blowing through it ). I have been cold while wearing the vest but only when wearing it above a shirt (long sleeve and short) in cool weather. I have also practically cooked in it while wearing the vest inside my Tourmaster Jacket on very warm day (the vest was then sealed up so to speak ). I believe it's very versatile in its ability to keep you cool or keep you warm. I guess it all depends on layering or lack of it. Most MX protectors/pressure suits have a big slab on the front with little or no venting. Another great feature of the Tekvest is that it's lined inside with Coolmax so it wicks moisture away. Not all the Tekvest models offer the same amount of venting. Especially the winter models which feature mostly solid panels. I finished up Lance Oliver's, The Ride So Far and I'd describe it as a nice 'light' reading motorcycle book that might just spark a desire to put the book down and pick up the keys to your motorcycle. This was not a tech manual or round the world story... just a guy talking about his motorcycle experiences and some of his thoughts on them. I managed to read it cover to cover over a long weekend. That's a lot faster than I read most motorcycle books so that in itself should tell you something about how I enjoyed it. It was a real pleasure to read. I do enjoy technical motorcycle books and read my fair share of them but this felt a little less like work and a little more like something you want to do. I laughed several times throughout the book and found myself nodding in agreement on some of his beliefs about motorcycle safety. Oliver's stories about some very embarrassing motorcycle experiences are particularly entertaining and make you feel a little bad for the guy! Who among us hasn't done some stupid things they wouldn't do differently? Oliver has some that are pretty hard to top! Definitely a worthy book to consider if you're looking for some casual motorcycle themed reading! What is it about riding a motorcycle that has us all so hooked? Whitehorse Press is pleased to announce publication of a telling new book, The Ride So Far: Tales From a Motorcycling Life by popular motojournalist Lance Oliver, who has spent more time than most of us thinking about this question and writing with wit and insight about his own lifelong passion for two wheel tuning and travel. Whether dodging wildlife on a laid-back ramble through West Virginia, describing the sensation of plunging down the famed Corkscrew turn at Mazda Raceway Laguna Seca, or plumbing the psychological depths of our slightly exaggerated emotional attachments to our motorcycles, these original stories go straight to the essence of what it is about riding that is so much more than another way to get from here to there. 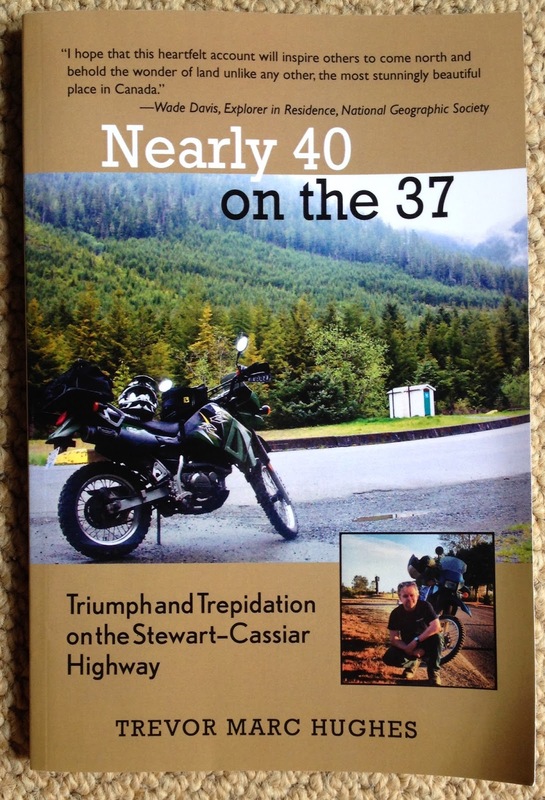 Any motorcyclist who has ridden down a highway will identify with these tales, which are by turns whimsical and serious, hilarious and heartfelt. In Part I, Great Places and Memorable Rides, Oliver takes us along to destinations both famous and obscure, from California’s Pacific Coast Highway and the Mount Washington Auto Road in New Hampshire, to anonymous country lanes in Puerto Rico and Canada. Even if you’ve been to some of the places he writes about, you’ll see them from a new perspective, thanks to his eye for detail and his knack for describing not just the destination, but also the unexpected delights found along the way. Oliver also shares some unusual rides you may not have imagined, whether he’s inexpertly troubleshooting a 40-year-old Italian Motobi at roadside during the Motogiro USA vintage road rally, flogging a 125cc tiddler at full throttle in a non-stop charity run around Lake Erie, or test riding a Kawasaki Ninja ZX-10R on the surrealistically smooth asphalt of Losail International Circuit in Qatar. Part II, Ruminations & Meditations, digs into the things we all talk about when the kickstands are down, such as the potent mix of memories that well up when we think back to our first motorcycles. You’ll find yourself chuckling along (and probably recalling some of your own foibles) as he ‘fesses up to some of his less stellar moments on two wheels (“Nothing focuses a young man’s mind like gasoline streaming toward his crotch, just inches from hot engine parts.”). We have our own reasons for riding, but few accounts are more engaging than these well spun tales from a varied motorcycling life. The Ride So Far will have you nodding in agreement, “Yes, that’s just the way it feels.” It will inspire you to head for the garage and go forth to write your own riding adventures across the face of the earth. Check out more books we've read HERE. Softbound, 8 1/4inches x 10 1/2 inches, 205 pages, color photos, and illustrations. Overall a good and useful book to help you organize the one part of the house you probably get to control the decorating of! Even if you're just setting up a little spot in the garage to do some repairs this book will come in handy - offering tips from the pros. Setting up a motorcycle workspace seems easy - until you do it wrong. Get it right - the first time! Order yourself a copy of this helpful guide. Whether you're organizing a corner of the garage set up for routine maintenance or a dream motorcycle shop, How to Set Up Your Motorcycle Workshop, 3rd Edition will help you create a motorcycle workshop that makes the most of available space, and equip it with the tools necessary to get any job done. Whether you plan only to keep your bike clean and in good repair or you want to become seriously involved with restoration, customization, or even professional repair, this book will show you how it’s done. There are in-depth shop profiles that include: personal garage workspaces, professional shops, specially-built professional restorer’s shops, multi-purpose shops, and race shops. Each profile has a scaled layout of the shop with color photos, as well as thoughts and tips from the owner and designer of that shop. Author C.G. Masi also explains the basic principles of planning and designing workshops, with practical advice on what equipment you’ll need. He offers helpful suggestions about which tools to keep with your bike, which tools you’ll need in emergency situations, electric power tools, computers in the workshop, and valuable advice on which tools to purchase, which tools you can fabricate, and best of all, how to use them properly. Amusing anecdotes recount real-life experiences, with examples of what to do and what not to do. 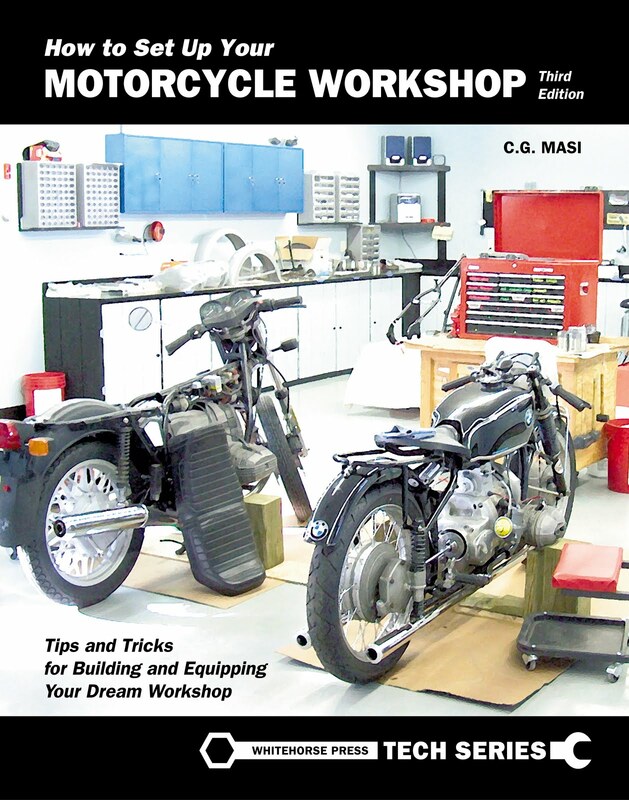 With more than 200 color photographs and detailed illustrations, How to Set Up Your Motorcycle Workshop is a must-have, money-saving reference you’ll return to time and again. It is one of Whitehorse Press’s perennial bestselling titles. 420 pages, with many color photographs. 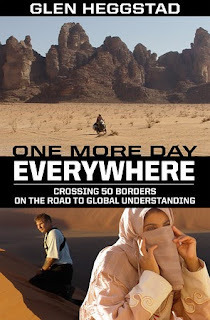 Finished reading Glen Heggstad's, One More Day Everywhere a few weeks back and have just gotten the time to do a review. Having a two-month old around the house has really cut into free time! Most motorcyclists might better recognize Glen by his nickname, Striking Viking and his posts on the popular adventure rider motorcycle forum (www.advrider.com) . One More Day Everywhere is his second book. The first of course was Two Wheels Through Terror - an edge of your seat account of his journey in South America and capture and torture by rebels. Read it! One More Day Everywhere is his follow up work and takes place three years after the 2001 South American trip. Glen was searching for meaning and his adventurous spirit took him on the road on a motorcycle looking for it. Starting in Japan, Glen worked his way through Siberia, Mongolia, Europe, the Middle East, South East Asia, and Africa, stopping in over 30 countries. Glen doesn't follow the easy route through these countries though. So if you're looking for an account of where to visit to see all the tourist sites and five-star hotels this book isn't what you're looking for. Glen prefers to stay off the beaten path for the most part. In this adventure he battled extreme temperatures, knee-deep mud, bureaucratic roadblocks, health problems, and loneliness, but when the going got rough Glen always found that locals and fellow bikers were never too far away and willing to lend a helping hand to this stranger from California. Everybody seemingly knows at least one famous person from California - "Awwwnold Schwarzenegger." Heggstad appears to have a positive outlook about most people and seems to try to find the positive in even the most negative or difficult situations. After reading this book there's no doubt that Glen encountered plenty of difficult situations. An experienced world traveler he tries to learn some of the language of the people he's visiting; which seems to go a long way in creating friendships and giving people the sense that he's an okay guy. That's never a bad thing when traveling in far away places. Glen isn't shy about letting his views on the politics, religion, and culture of the areas he passes through known - at least in the book. You're going to know where he stands on a lot of things after reading this one. Being a single man on this journey he also talks about some of the women he meets along the way. I wasn't really a big fan of his 1-10 ranking scale of many women he met - whether he had the possibility of some romance with them or not. It's not a big part of the book but it might bother some. I guess most people reading the book will be men and I know that some of the very popular posts he made on ADVRider were ones that he had posted of ladies he'd met during his trip so he was perhaps giving his audience what he thought they wanted. One thing I didn't expect after reading the book is that all royalties from Glenn's projects are donated to international aid organizations. Impressive! Having read a good many adventure motorcycling books I can say that this was an enjoyable and easy read. Glen's writing is clear and easy to follow (something that can't be said for all motorcycle adventurers turned authors). Glen is skilled at building suspense and offers vivid descriptions that help you feel like you're a part of the ride. You may not necessarily agree with all his politics but if you're interested in round the world adventure by motorcycle books this is surely one you should have on your bookshelf. I've had a can of Tirox cleaner on the shelf in the garage for a little while now, just waiting until I had a little time to break it out for a test. My chain was good and dirty so this would surely be a true test of the cleaning power of Tirox. Unfortunately I didn't think to take a "before" picture - but trust me... it was really, really dirty! Tirox - it's pronounced "Tie-Rox" by the way, or at least according to the manufacturer. There's a few things that really created some interest in the Tirox brand for me, and this motorcycle chain cleaner in particular. Firstly - I was looking for an easy to use product that didn't involve a lot of effort. I didn't want to have to remove the chain or break out any tools to get the job done. When researching on forums what people use to clean their chains one thing regularly sprung to the top of the list - kerosene. In fact, kerosense is recommended as a cleaner from most leading chain manufacturers. I didn't want to buy kerosene and research just where to get it in a small quantity, deal with storing it, and after the chain was cleaned - disposing of it. It seems just plain easier and more convenient to have an aerosol can of product that I know is specifically designed for cleaning chains. It just so happens that Tirox chain cleaner contains mostly kerosene so you can be sure it's not going to cause damage to the o-rings in your chain. Second - I wanted a product that worked. I had to take the word of the guy at the parts counter at the shop I'd bought it at but figured I'd give it a try and see for myself. Given the thought that seemed to have gone into the product it seemed that they likely had put some similar thought into a product that worked. A prime example of the thought put into their product; their 360 degree chain brush that comes with the cleaner. With thousands of bristles, this handy little brush comes packed in the cap of the cleaner and you stretch it out and spin it on your chain. It's a patented design. And yes, it's a huge leap in effectiveness over the old paintbrush or toothbrush option. Once the 360 degree brush is in position you just spin your back wheel and hold the brush in place to give it a good scrub. My bike has a center-stand so it's a pretty simple process. Don't be 'too' delicate with the 360 degree brush when trying to get it on the chain; it seems to require a somewhat forceful effort to spin it on. Once on, it scrubs the chain from every angle. When the chain is cleaned to your satisfaction you just spin the brush off and give it a spray with the chain cleaner to clean it up a bit. Fold it back up and back in the cap it goes. Easy! And finally, but not least importantly - this product is Canadian! That's a big bonus. Tirox is based in the southern Ontario manufacturing hub. So buying this product is supporting a Canadian company and Canadian workers. The instructions on the can tell you that it works best on a warm chain. A version of the instructions on the Tirox website doesn't but I cleaned my chain on a bit of a nasty day in my garage so I skipped the chain warm up. I suspect a warm chain might help the cleaner penetrate quicker and you might get away with using a little less product. I'll perhaps give the warm chain a try next time to compare. I'd definitely recommend getting yourself a set of gloves for this job. It's messy! I have a big box of blue nitrile gloves (Costco, Princess Auto, or any hardware store ought to have'em) in the garage for just such jobs. I also grabbed a bunch of papers from my recycle bin and laid them out on the floor to absorb all the drips and to keep all the gunk off the rear tire too. I paid $16.95 for a 312 gram can. It took about half the can to do a thorough cleaning. If you didn't let your chain get quite so dirty and used it on a warm chain I suspect you could probably stretch out the number of cleanings you'd get out of a can up to 3-4 cleanings. The Tirox website shows that you can buy the 360 degree brush separately now too. Their MSRP is $12.95. So, that makes the $16.95 for the brush and can of cleaner seem like a pretty good bargain. This product is available at most motorcycle dealerships in Canada and is indicated to be manufactured for Parts Canada on the can. If you don't see it on the shelf at your local shop then they should be able to order some in for you. - Convenient and easy to use. - Makes cleaning your chain pretty easy. - Cons: There's only one that I can see, it's more expensive than using simply kerosene. That's not really a con for me because using kerosene just isn't practical for me. I have a limited amount of space in my garage and desire a simple and quick chain cleaner. Tirox fits that need - kerosene doesn't. I might have to pick up some of their other products: Ultra-Lube, and Bike-Wash and give them a try. More details on Tirox can be found on their website HERE. A new book has just arrived at Canadian Motorcycle Rider headquarters! It's a comprehensive vintage motorcycle guide in handy pocket-sized form. 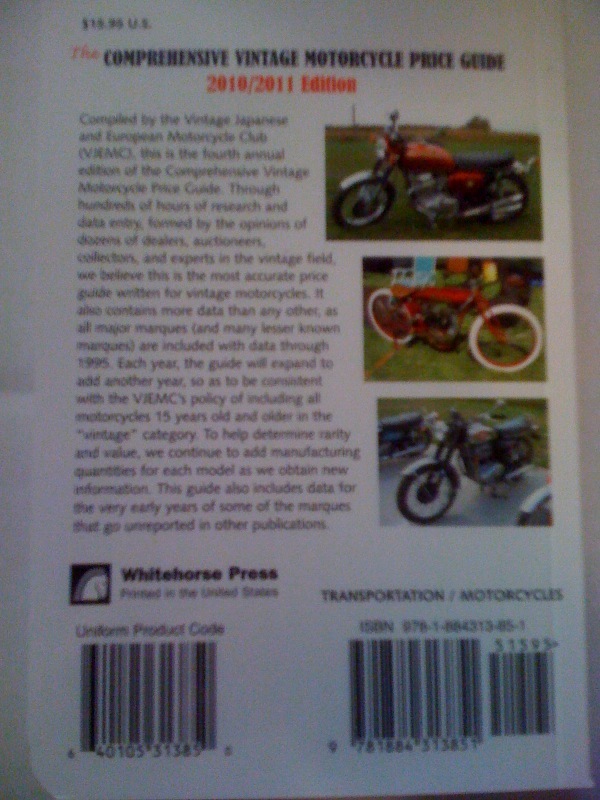 Compiled by the Vintage Japanese and European Motorcycle Club it's a convenient reference from Whitehorse Press that any vintage motorcycle enthusiast would appreciate. Think of it as the little black book for vintage motorcycles. Now, it's a little more difficult to judge the values of vintage motorcycles than the typical makes, the VJEMC has conducted hundreds of hours of research for this updated version. They've gotten the opinions of dozens of dealers, auctioneers, collectors, and experts in the vintage field. 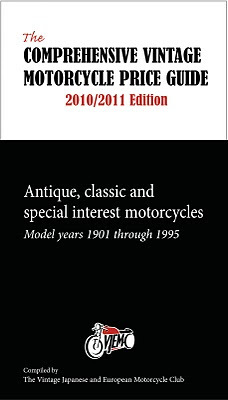 The book is updated in include motorcycles that are 15 years or older. 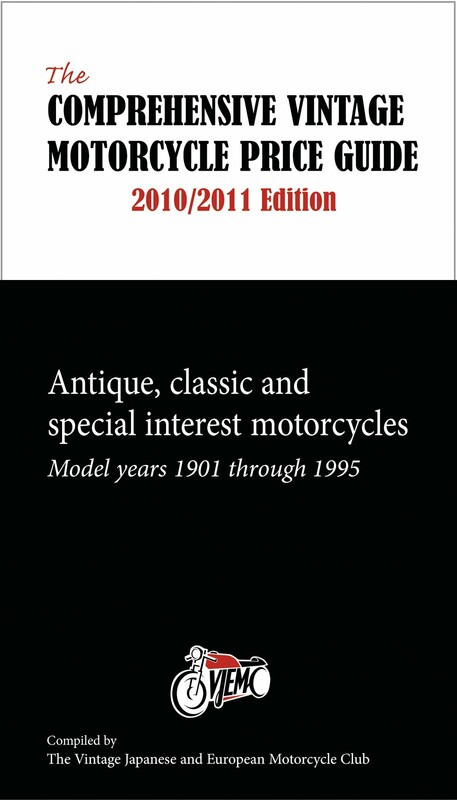 Antique, classic, and special interest motorcycles Model years from 1901 through 1995. 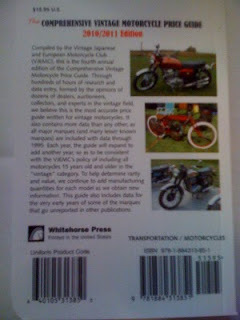 Whitehorse Press is pleased to announce publication of the fourth annual edition of The Comprehensive Vintage Motorcycle Price Guide, compiled by members of the Vintage Japanese and European Motorcycle Club (VJEMC) who collect data from auctions, vintage dealers, marque experts, and internet sales throughout the year. Designed by enthusiasts for enthusiasts, it includes price data for dozens of motorcycle brands from the U.S. and around the world, from Ace to Yankee and including major marques such as BMW, Ducati, Harley-Davidson, Honda, and Triumph as well as lesser known or more specialized ones like Ariel, Buell, KTM, Pope, and Whizzer. Each year, the guide is expanded to add another year, so as to be consistent with the VJEMC’s policy of including all motorcycles 15 years old and older in the “vintage” category. Formed by the opinions of dealers, auctioneers, collectors, and experts in the vintage field and confirmed by hundreds of hours of research and data entry, it is the most accurate price guide written for vintage motorcycles. Prices are derived from actual sales between knowledgeable enthusiasts and are given for six quality grades, ranging from rat-bike to like-new. The guide opens with an overview of which bikes are hot and which are not, with commentary by experts on why prices are changing as they are. It also includes a full description of how each price grade is defined and how to recognize which grade a particular bike belongs in. Printed in a handy pocket-size, it is the perfect companion to have with you at the next motorcycle rally or auction you attend, or even when you chance upon that rare specimen in a neighbor’s garage or a farmer’s barn and want to make an offer to “take-it-off-the-table” immediately. Just one insight gained from this price quide will earn back many times the book’s cost on your next sale or purchase. Read more CMR book reviews HERE. I'll admit - I had misgivings about wireless communications system. I assumed that it would detract from the 'zen' of the ride or perhaps affect my concentration. I figured it would take away from the ride. So, I've never once listened to music on a ride much less take a phone call. That is, until I tried out the Q2 Multiset from Cardo. The Cardo MultiSet Q2 is basically two communications systems that come factory paired so that two people - whether they're on the same bike or on different bikes - can use them to communicate with one another; straight out of the box. They can be used on their own too, or paired with other Scala wireless systems - which could be useful if you're traveling with friends for example. They could be used for ATV's, snowmobiles, dirtbikes, or side-by-side's too. Anything that makes a bit of noise really, as they're designed to be used in a environment with some noise. My first test with the Cardo system was to use it for a solo ride so that I could be sure I was familiar with its operation. A nice run of about 200 km's of secondary roads along the coast of Nova Scotia near Halifax provided the testing grounds. Two headsets, two helmet clamps, 2 wall chargers, 2 allen wrenches, 2 sets of velcro pads, 2 MP3 cables, 2 glue plates, 2 pre-moistenend towelettes, 2 carry pouches, 4 microphone sponges, and a user guide with warranty and registration form. The user guide is excellent and gives clear explanations (with pictures) of what each piece is and how to operate the device. Once the box was opened up and I had figured out what all the little bits were for, the next step was to get it hooked up to my helmet. I didn't want to stick the device to my helmet so I was really hoping that the helmet clamp would work on my Scorpion EXO-1000. The Scorpion EXO-1000 has an internal air bladder that sits between the shell and the helmet padding; there's also a really thick band of plastic along the bottom edge of the helmet where all the pieces are sandwiched together. Well, it took a little persistence but after opening up the clamp as wide as it would go and easing it on with a little pressure (but not enough to break anything) all was well. I tightened it down with the supplied allen key. It is surprisingly secure actually. Pushing on the unit in any direction and there's no movement whatsoever. Next step is to get the placement of the microphone just right. This part isn't too difficult really - you just have to place the helmet clamp in the appropriate place, the microphone is attached to the helmet clamp via a flexible arm so you can move and twist the microphone into the exact position you want. I couldn't even tell the microphone was there when it was properly placed in my helmet. The speakers are ultra-thin so that they'll fit into even the tightest of helmets. The Scala Rider system is more than a communication system. It has a FM Radio built in, you can hook it up to an MP3 player through the integrated jack, a voice activated GPS, or a cell phone. These are the features that will make it particularly useful for a wide variety of riders. I synched my iPhone to to the Scala System following the easy to read and clear instructions. Cardo claims a 1,640-foot range under ideal circumstances but says that typical is range is more like 800 feet. The range of the communicators is pretty impressive even at the typical range. Riders can communicate in full duplex contact (you're able to talk and listen simultaneously) with each other. - MultiSet includes two intercom systems. - Bike-to-bike Intercom up to 1,640 feet. - Cell phone connectivity along with FM and MP3 audio. - Well designed system with all the elements required to get you using the system quickly and with minimal fuss. - Excellent for business people who commute via bike and need to take calls. - Very clear communications; I was told from those who called me that reception on their end was excellent too - even at highway speeds. - An easy way to add music, GPS, and ability to use the phone on the bike. Remember, it's for your convenience so you don't have to answer calls if you don't want to! - Rugged design that's rain and snow resistant. - Cardo’s AGC Technology automatically adjusts the volume of the unit according to wind noise. - Lack of volume control with the MP3 player hookup. - FM tuner didn't seem to pull in strong signals and scanning for stations is done via the volume control which requires a very firm push to operate. I really enjoyed using the device to listen to music on my iPhone and I even took a couple phone calls. If I was going on a long distance solo trip, or especially if I were riding two-up, or with a group - I'd definitely have one of these systems. If I needed to be readily available via telephone, I'd also recommend it highly. While I didn't test the system with a GPS system I can see that a voice activated control GPS would work very well as it would allow for hands-free use of the GPS. Now, when you're on a group, or two-up ride you'll be able to communicate with those you're riding with without resorting to high-speed charades. Pit stops and breaks can be easily coordinated. You can warn others in your group about road hazards, or point out some interesting scenery. Even if you're just riding alone the device can keep you connected or allow you to listen to some of your favorite tunes. For more information about Cardo and the Q2 Multiset you can visit the company website HERE.